Everyone knows Captain America, but only a few try to be him. They call themselves the Real Life Superheros and they number 200 men and women across the States. Of their ranks, these four—Dark Guardian, Master Legend, Superhero and Mr. Xtreme—are among the most famous, and between them they show the range of people pressed to put on a costume to patrol—and protect—their neighborhood. We'll be introducing you to one a day as we lead up to Captain America's release asking what made them them suit up. Today, meet an ex-wrestler with his own supermobile, a cherry-red Corvette. Presenting: Superhero. BEFORE THE HERO: I'm ex-military, I'm a police academy grad. I was a weightlifter since I was 17 years old. In 1998, my wrestling career ended and superheros were my gimmick. Gimmick's an old carnival wrestling term, and from what I understand it's my fault that superheros call their personas gimmicks. 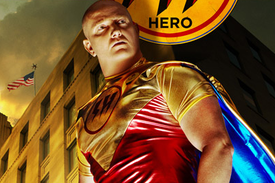 ORIGIN: I knew when I became a pro-wrestler that I always wanted to be a superhero, but I didn't know how. One day, me and a guy were sitting around in wrestling school in St. Petersburg and he says, “Why don't you just call yourself 'Superhero? '” Bam. Sold. I have the most boring origin story. I wasn't bitten by a radioactive spider. I literally just said to myself, “What would happen if somebody did this for real?” And out the door I went. COSTUME: My suit is basically a tribute to Golden Age, Silver Age comic book superheros. It's very bright and looks like a superhero's gimmick. You can't take yourself seriously dressing the way I do. A lot of guys nowadays dress up like these emo Dark Knight, Twilight, wanna-wear-all-black nonsense. I try to discourage that wholeheartedly because this is reality, not a comic book. The first time they go out, they come back and say, “The cops cavity-searched me and demanded my ID!” Yeah, you were wearing a black mask and a black trenchcoat and black boots and even black underwear—what did you expect?! WEAPONS: It's Florida. I'm allowed to carry a concealed handgun. FIRST TIME ON PATROL: Back then, all I had was a Nissan Sentra, my wrestling gimmick and a floor jack. I started helping people at the side of the road, putting out car fires. I prevented some muggins, I helped look for lost children. As my income increased, I acquired the Supermobile: a red Corvette. I wasn't really nervous at all. MEMORABLE DAY ON THE JOB: One night I was headed up a suburban street and on the sidewalk, there's a guy in a Hoveround—a powered wheelchair scooter—passed out and I'm like, “Oh my god, he must have had a seizure!” I flip the Corvette around and come blazing back to him and he's moving around. I pull to the side and say, “Sir, are you okay?” He's says he's fine but he is bombed out of his mind in the middle of the night driving a Hoveround down the sidewalk. Well, I got out of the car because I thought I should hold him for the cops because he's drinking and driving. Except he's drinking, but he's not in a car. He's driving, but he's on the sidewalk. Is he committing a crime or not? So I saluted him, said “You have a good night, sir,” and drove off. REAL LIFE IDENTITY: I don't keep it a secret. For me, there was no point in having a secret identity. I work out with a bunch of cops and they'd know me immediately. Plus, I drive the Supermobile, so they could find out who I am anyway. The negative is there have been a handful of real life superheros who have tried to get me fired from my job, threatened my life, been completely convinced that I was some kind of government agent who was spying on the community. I've never had a problem with a supervillain, but I've sure had problems with superheros. There are some very eccentric people who do this 99 percent of them are good, but there's a bad apple in every bunch. A lot of people have criticized me saying, “Well, that was real imaginative to call yourself Superhero.” But when I show up on the scene of a car crash, an accident, a lady laying in a parking lot—all three have happened—and I say, “I'm Superhero and I'm here to help,” they're immediately reassured. Whereas if I said, “I'm Chainsaw Killer and I'm here to help,” they might be a little nervous. When I first started doing this many, many moons ago, there were just nine other guys in the country doing this. The internet wasn't that established, but I eventually said, “I wonder if there's other people in the country doing this?” I looked and there were nine other guys. Then 17. Then 30. Nowadays, as near as we can figure, there are about 200 active guys and gals who do it and about 100 other ones who are getting their gimmicks together and starting to do patrols. I was ostracized by my mother for 13 years. For me to do something like this, she thought I was obviously insane. But earlier this year, she showed up at my door and she'd done research on what I do and she said she understood.